New offerings promote healing and wellness through management of stress, anxiety, and pain. 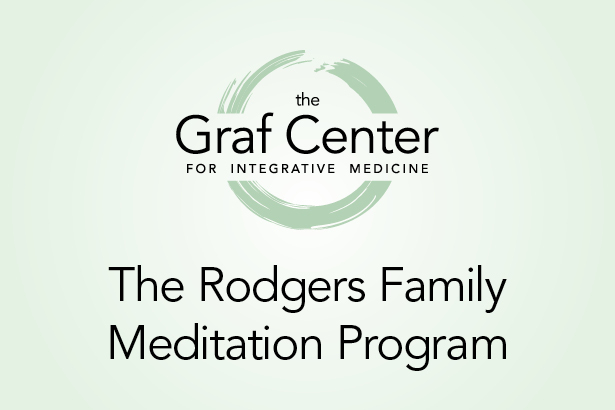 Englewood, NJ (January 18, 2018) — With the turn of the year, the Graf Center for Integrative Medicine at Englewood Hospital and Medical Center is launching The Rodgers Family Meditation Program to grow its array of holistic services and highlight the link between traditional medical treatment and mindfulness. The new wellness program expands meditation offerings to patients with chronic conditions such as cancer or heart disease, as well as to clients in good health looking to reduce stress, lower blood pressure, and manage pain. Among its additions are meditation for stress, anxiety, and depression, a class led by Mark Van Buren, mindful living trainer, yoga and meditation instructor, personal trainer, musician, and author; and meditation for stress and pain management, a class led by Jeri G. Kadison, a certified yoga and meditation instructor. Meditation for stress, anxiety, and depression, held on Monday evenings, teaches simple meditation techniques to help relax the body, center the mind, and build resistance to stress by incorporating meditation into the daily routine to boost mood, and better manage life stressors. Meditation for stress and pain management, held on Wednesday mornings, teaches mindfulness using breathing techniques and slight movement to reduce the risk of stress-related diseases. Other classes include guided meditation in Spanish, pre- and post-surgery meditation, and acupuncture for stress and ailments. Additional special offerings include a well-being and weight loss six-session series, and events introducing Reiki, massage and meditation, and the healing power of sound. Established in 2015, the Graf Center and its team of licensed and certified professionals provides evidence-based services to patients, their families, and the general community to promote prevention, recovery, and support in a safe, comfortable environment.